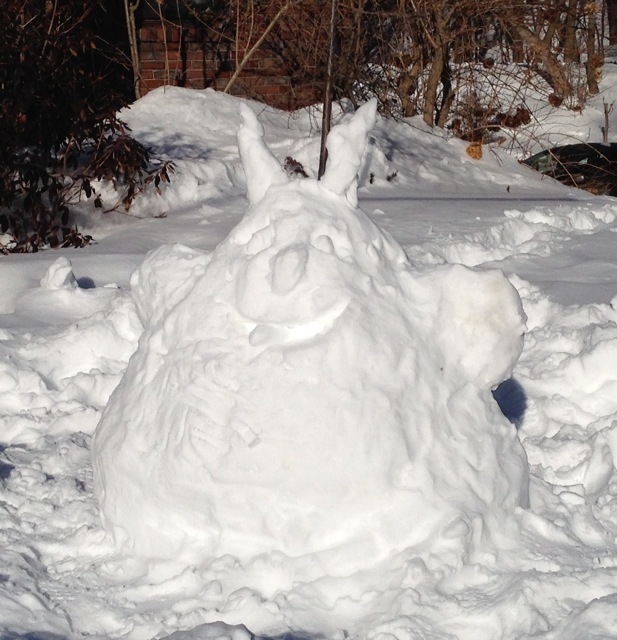 Meet our snow creature: Snowtoro! Note: Another big storm is blowing through our area tomorrow with 12 inches of snow and freezing rain forecast. Another snow day and more sledding. Woo-hoo! Wonderful post! your snow Totoro reminded me happy times. Everything starts with “Once upon a time”, isn’t it?? Wow, that snow keeps coming!!! 😀 I love your snow Totoro, what a great idea – love the ears!!!! I have seen that lovely story and a whole load of others by Hayao Miyasaki, I think he’s quite wonderful! Apart from Totoro, my favourite is Grave Of The Fireflies, it was the first one of his I ever saw. A tragic story and very real, and not so much for kids, but very powerful, had me crying a lot through that one! That introduced me to a whole new world of film, and there are still some I haven’t watched – yet! The snow banks are so high, only my husband is tall enough to throw the snow up and over. We have another storm due Thursday. The whole city may disappear! So sweet and lovely!… I love Snowtoro and your beautiful haiku Bren!~ I am checking out the trailer for the movie too!. Glad you like my little Snowtoro (really it belongs to my kids). Next maybe a snow Poseidon! Snowtoro savoring his snow on his tongue and his impish grin enchanted me, Brenda! I remember this tale, one my oldest daughter found on Netflix and showed Skyler and Micah. This was such a really nice haiku accompanying your snow creature, too! hugs! Apart from My Neighbor Totoro, what are some of your favorites? Oh, I like Ponyo, Howl’s Moving Castle, Kiki, Princess Mononoke, Nausicaa. Spirited Away is kinda creepy, but still brilliant. I hate that the parents turn into pigs. But the river spirit is cool. I love Miyasaki films! My kids do, too. They have such charm. I love that movie!! I love the poem and I adoooore that snow toro!! 🙂 🙂 🙂 I want to build one too!!!! We just don’t build your regulation snowman around here. LOL Merci du compliment!! Oh, that would be a challenge!! Yeah! Another snow day has already been announced, so I let my boys stay up to watch the Superbowl. Most exciting 4th Quarter EVER!! And we won! Yeah! (Sorry Seattle) Woo-hoo! Awh, Totoro was one of my favorites from Miyasaki (even though my friends are inclined to disagree :c)! Also, cute haiku. The closest to snow we’ve gotten here is… no snow at all, unfortunately. Aw, well, Snowtoro sends a big, cold hug your way. 🙂 Yeah, another Miyasaki fan! he’s the snowblog monster! i like him! Yes, he is the blobby blogster! 🙂 He’s grinning at you! Very nice! It has been a long time since I’ve seen a snow man of any kind and never a snowtoro! We haven’t made a snow creature in years. I love that movie and aren’t afraid to admit it. Spirited Away, too. I love Studio Ghibli. Can’t wait to see the new Princess Kaguya. Glad you like them, too. What a nice thing to say! 🙂 Thanks!